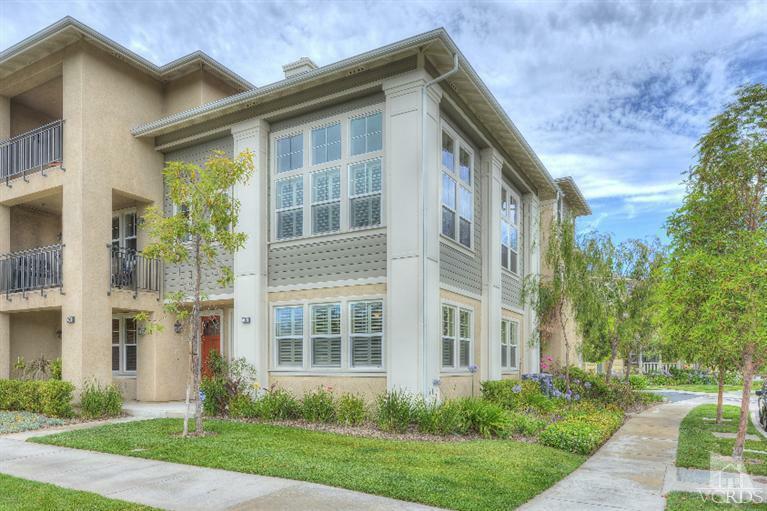 Located in master planned River Park community is this gorgeous, light & bright, corner unit, 4BD 3.5BA tri-level townhome. Pride of ownership in the numerous upgrades incl. hardwood & tile flooring, high, smooth ceilings, recessed lighting, plantation shutters, custom paint, ceiling fans, dual-paned windows & 2-car garage w/epoxy flooring & built-in cabinets. The first level features a mother-in-law suite w/separate entry, a bedroom, living room, kitchenette & bathroom. The second level features a spacious, light & bright family room w/cozy inlaid fireplace, gourmet kitchen w/granite countertops & bar, stainless steel appl., 2 guest bedrooms, full bathroom & a balcony deck overlooking incredible views of the community & the Ventura mountain ranges. The third level offers an office nook & master bedroom w/huge walk-in closet w/built-ins, master bathroom w/dual vanity sinks, large tub & separate shower w/travertine tiles. Close to The Collection at River Park, harbor, marina & beaches.